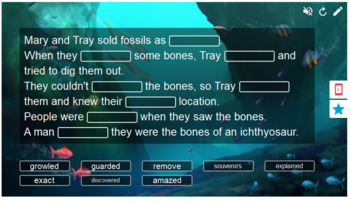 This product contains 2 The Dog that Dug for Dinosaurs Vocabulary activities created using the Smart Lab feature of Smart Notebook software. These games are so much fun for kids! 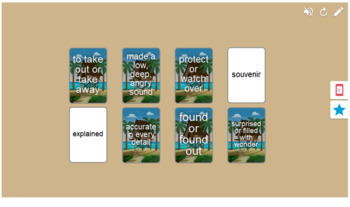 They can be done as a group on an interactive whiteboard, or sent to individuals to be completed on their own devices. Smart Notebook 17 or higher software is required for these activities to work, so please make sure you have this software before purchasing! These games are all included in my Journeys Smart Lab Pack for The Dog that Dug for Dinosaurs, so if you already purchased that, don't purchase this! These games are all completely editable to fit your needs and preferences, all you have to do is click on the pencil in the upper right corner and edit away! You can also use the red device symbol to send to individual students to complete on their own devices (Smart Notebook 17 or higher software required). You can access more game features using the star symbol as well. All graphics are owned by Smart software, I only used the software to create the games.